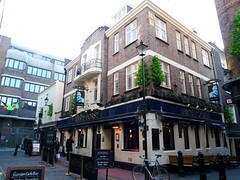 A pleasant relatively quiet pub, tucked away from the tourist horde behind Carnaby Street. Had the currently popular Deuchars IPA, London Pride and a Christmas Ale with a lighting up pump clip when visited in December 2007. Last visited by gellyfish, 10 December 2007. Last edited 2017-02-05 17:43:20 (version 10; diff). List all versions. Page last edited 2017-02-05 17:43:20 (version 10).